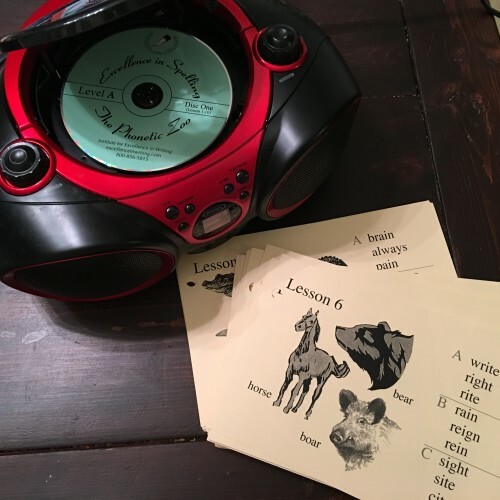 Phonetic Zoo, a spelling program by The Institute for Excellence in Writing, is a program I have heard about for years, but I never really knew anyone who used it for me to ask my questions about how it worked. I was SO excited when I was chosen to do a review of the program on the blog- hopefully, this helps clear up some questions for you on how it works. Bug has been using Phonetic Zoo Spelling Level A [starter set] for about a month now. During the lesson, your child will listen to the CD with their pen in hand. First, they will listen to the spelling rule (see the jingle above). Then, the lesson will say the spelling words, and a sample sentence aloud. Your child will write the words as they hear them. Every couple words, the jingle is repeated, so your child can remember it. There are two speakers on the CD, one speaks more slowly than the other, and Bug struggles to keep up with the faster speaker. He has learned to pause the recording so he has time to write. Once they finish reading the list, they go through the list and spell the words aloud so your child can check their work. I was a little disappointed in this program for the above reason. The materials are all high quality, and the audio recording is very well done, but we couldn’t get past the complicated rules and jingles to make sense of how the words were supposed to be spelled. However, I did enjoy the independent component of this program. Bug is able to sit down and practice his spelling words while I am at work, or teaching one of the other kids, and I know he is not only practicing but is checking his work along the way. He’s been moving quite slowly through the program, because until he can spell every word correctly, he can not move on. I added his word lists into an online practice program to help him with additional drill, which has helped him move more quickly. Bug also enjoyed that the lesson says “this is not a test, it is practice.” He is hard on himself, and can be a perfectionist, so it was helpful for him to hear that he didn’t need to stress about the lessons. He has worked diligently with the program and has maintained a good attitude. 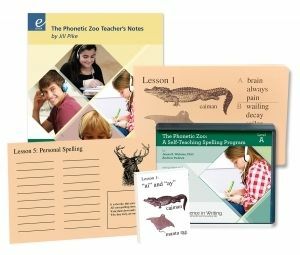 We will not be giving up our spelling program for Phonetic Zoo, because I feel like we need a little more guidance in the how and why of the English language, but I do feel like this is a viable option for parents who need an independent program, or have students with strong auditory learning preferences.